Fellow club members and new visitors, im working on this and will be developing this continuously. Any information that is wrong, tell me in the 'comments' thread below. To begin with below I’ve listed relevant sections that this forum thread will explore, will give you not only generic information about each model, but as much detail unique to each model as I could gather. Let me welcome you to THE 75 AND ZT CLUB. As you have no doubt posted somewhere on the forum enquiring about either the Rover 75 or MG ZT (shall be referred to 75 and ZT from now on, and 75-T and ZT-T in tourer form) as a potential car to purchase and have been redirected to this guide. The single thing you must realise before purchasing either a 75 or ZT that this guide may look like a horror story of faults and problems, HOWEVER these problems are no worse than you would get with any other manufacturer, including the German and Japanese brands and showing these issues up front will prevent you being exposed to nasty surprises and allowing you to negotiate for repairs in the purchase price. I produced this guide to allow people to avoid wasting money on cars that might seem like a bargain and are actually a money pit. I myself purchased my current 2001 MG ZT V6 in 2009 for £500 following this guide. The car had 109,000 miles on it. It it was my second MG ZT V6, the first one was a 2002 and I payed over £2000 for it 18 months before hand for a car of lower specification and it had 92,000 miles on it! This guide will help you hopefully make the bargain buys like I myself and many others on the forum have made. Last edited by Colin_NI; 3rd August 2011 at 23:57.. The Rover 75 is an executive car produced initially by the Rover Group at Cowley, Oxfordshire, UK, and later by MG Rover at their Longbridge site in Birmingham, UK. The Rover 75 was available with front-wheel drive in either a saloon or estate body and latterly, in long wheelbase form (the limo had 100mm rear leg room stretch for the rear passengers) and a rear-wheel-drive, V8-engined specification. The car was unveiled to the public at the 1998 Birmingham Motor Show, with deliveries commencing in February 1999. In 2001, three years after the launch of the Rover 75 and less than a year after the de-merger of MG Rover from BMW, the MG ZT and MG ZT-T were launched. 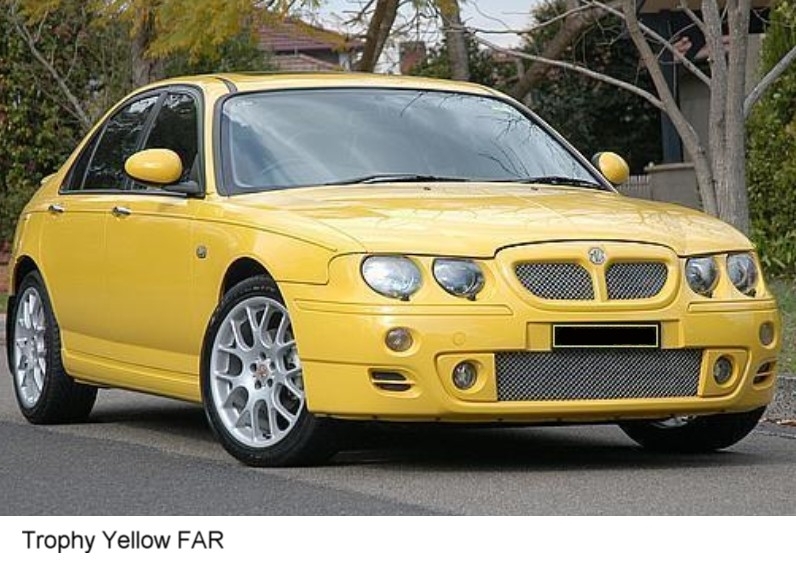 The body shell and chassis of the car was almost identical to the Rover 75, but with more aggressive grille, sportier styling, stiffer suspension and re-tuned engines. Production of the Rover and later MG badge models ceased on 8 April 2005 when manufacturer MG Rover Group entered administration. You can still find both 75's and ZT's that have yet to be registered with delivery miles, that where sold when MG Rover went into liquidation and cars that where made in 2005, where often sold and registered after that date along with cars that where shipping off from England, where brought back and sold again into England! 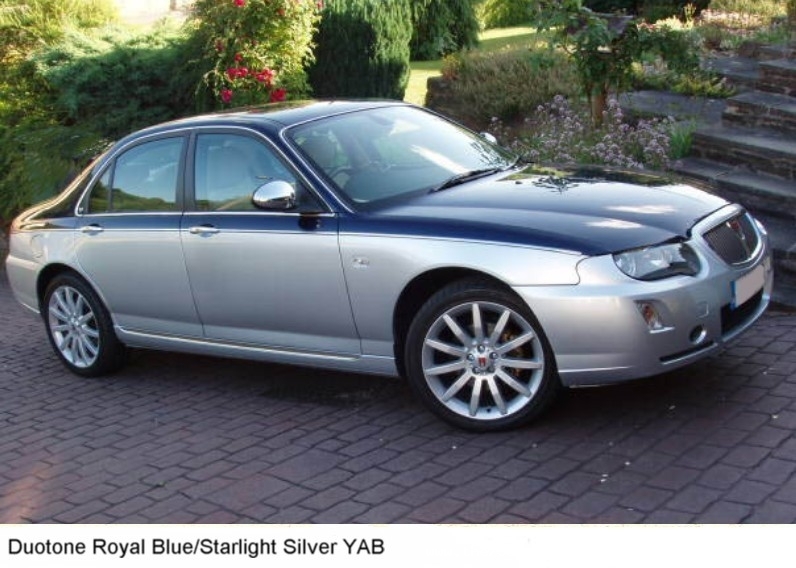 So purchasing a 2009 registered Rover 75 with delivery miles is still a realistic chance if you are willing to pay for it! A key feature of the 75/ZT range was actually its safety in crash tests, making 4 stars in NCAP tests and 5 stars when the cars where fitted with the optional head "pillow" side air bags. These are the same standard of tests that are used today. Ive provided a link to a video of the cars being tested. Note, that some cars on ''S'' regs exist, and S reg cars are usually preproduction models that where sold on in 1999 alongside ''T'' reg cars and are quite desirable within the club itself but maybe not to the casual individual. The Rover 75 and MG ZT where survived by SIAC and Nanjing Automotive (Now one company and selling under the MG name in the UK) who purchased between them the rights to all the MG and Rover cars. The MG 7 was essentially a mix of both 75 and ZT parts and was sold in china, asia and parts of australia. The Roewe 750 was based on the Rover 75 limos (with a 100 mm stretch in the rear cabin for more leg room, modern rear end similar to the 5 series of the time, V8 front end as seen on the UK Rover 75 V8 models and a revised interior) and was also sold in China and Asia. Neither of these cars will be sold in the UK. Last edited by Colin_NI; 30th July 2017 at 06:37..
People have a terrible opinion of the Rover K series engine and its deeply unfair. They have a reputation for head gasket failures and was exposure on BBC's Watchdog during the 1990's. As a result, all Rovers suffer HGF according to the uninformed! The fact that HGF occurs on many cars is often the result of a problem elsewhere that has not been addressed. The fact that Lotus used them in their Lotus Elise sports car should be proof enough that they can be reliable when driven hard IF maintained appropriately. If anything a 1.8 or 1.8T is usually a bargain because people are afraid of buying a K series engine 75/ZT. These are alloy engines and the appropriate maintenance and checks of the cooling system are essential as on any other make. People are dangerously ignorant to the fact that you can not run a car for 12,000 miles a year without checking the oil, coolant and other such parts and only do it once a year for the MOT. These are the people who often had the failures in their cars! Head gasket failure on the 1.8 and 1.8T engines typically occurs around 30,000 miles, and thus the majority of high mile 1.8/1.8T engines will almost certainly have had ''a head gasket repair'' done at some stage. If done correctly, then we have multiple members whose cars have done into the 100,000 of thousands of miles!!! When purchasing a 1.8/1.8T ask if the head gasket was done. If it was done, ask for the receipts as often people cheat and simply pour a tank of "Radwell or K seal" into the engine coolant tank which will temporarily cure the car, often enough for you to have driven the car away and it fail a week or two later. Its a dirty trick in the second hand market, HOWEVER some people have reported it has worked to their advantage curing tiny leaks. I will cover in detail the list of parts and procedures and what to watch for specifically in the 1.8 and 1.8T engine sections along with photos and explanations of what is what. It should be noted that the 75/ZT V6 engines KV6 almost never have a head gasket failure, and it is extremely unlikely to occur unless servicing has been terrible. Be wary of mechanics claiming the V6 needs head gasket work as 90% of the time, they wont know what they are talking about. The KV6 can have a failure however it boils down to poor maintance not a mechanicial fault, but like anything mechanicial it can still fail. The diesels and V8 NEVER suffer a common head gasket failure as they are BMW sourced and the V8 is Ford sourced. Take the car to a recommended Rover/MG expert every time as mechanics love to con people with Rovers and often do more and I mean MUCH more damage than good. Ask on the forum for someone in your area and recommendations!!! On the subject of parts. With such companies as Rimmer Bros (www.rimmerbros.co.uk), X-part (www.xpart.com a division of Caterpillar Inc also, X-part are the Mg Rover approved servicing centres around the uk) and the various aftermarket manufactures, there are very few and I mean very few parts that you can not get for the cars. These are often found on the owners forum of www.the75andztclub.co.uk along with advice on substitute parts that work just as well. Again, a great reason to become a member of a owners club. Last edited by Colin_NI; 3rd August 2011 at 23:59..
A member of the club "Jules" made this post recently and I felt it may be potentially useful when buying a second hand car from a dealership should things start to go wrong after or before you have bought your car! Of satisfactory quality. It must meet the standard a reasonable person would regard as satisfactory, bearing in mind the way it was described, how much it cost, the make, the age, the history, the mileage, the intended usage of the car and any other relevant circumstances. Amongst other things, this covers the fitness, appearance and finish of the car, its safety and its durability. The car must be free from defects, except when they were pointed out to you by the seller before you agreed to buy it or where you have inspected the car and that inspection ought to have uncovered the car defects. Even where a car appears to have a minor defect, it may still be of unsatisfactory quality if that defect could lead to extensive damage or render the car dangerous to drive. - It is not sufficient that a car is merely roadworthy and safe. - The dealer may be liable for faults that were present at the time of sale, even though they may only become apparent later on. As described. This covers all statements made about the car, whether in writing, in a conversation over the phone or in the showroom, in a newspaper, website, email or text, or in documentation. If the advert states "air conditioning and CD player" then the car should come with these features and they should be working. Reasonably fit for any normal purpose. It should get you from A to B with the appropriate degree of comfort, ease of handling and reliability that a reasonable person would expect. Reasonably fit for any other purpose you make known to the dealer. For example, if you require a vehicle for towing a caravan. Excellent advice, and one that will serve many members well into the future! Last edited by Colin_NI; 4th August 2011 at 00:00..
Last edited by Colin_NI; 30th July 2017 at 06:38.. This is a list of common faults all the cars can suffer from, none specific to engine, transmission or bodyshell type and is very much worth noting. The majority of these problems are very simple fixes and can be excellent bargaining tools when purchasing a car. From now on, all Rover 75/Rover 75 Tourers/MG ZT/MG ZTT's shall be referred to as "the cars" however unique tourer and saloon problems are listed at the end. You will note mention of the "T4" diagnostics machine a lot. This was a computer system designed for the MG Rover cars, to give readouts via an ODB plug in the cars (Just above the accelerator pedal!). A T4 can preform many specific tasks on our cars, and often only a T4 can read them correctly, despite what many other aftermarket systems offer. A T4 session can be booked through your local X Part dealership, the website and contact details can be be found in the useful links section. Additionally this map shows the dealers in the regions around the mainland UK. Servicing and service history can be an issue with cars, especially with so few MG Rover focused dealerships now days, often they will have been maintained by mechanics not knowledgeable in the solutions. This forum is proof of it and many cars have been saved through the DIY and how to guides. The first thing you want when purchasing your car is the keys to drive it, well check there are two keys with it! Purchasing new keys that actually work properly is an expensive (£180 - £220) and takes a while because they have to be supplied by BMW in Germany. That means you have to seek out an authorized UK agent to start the process which is an Xpart dealer and also has a T4 to code the keys correctly to the car. A considerable expense on a second hand car! A member on here "Lates" can help out as he can order keys at a discounted rate. You may also notice the key fobs are worn or split around the rubber area you press your finger on to activate the fob itself. You can source these on ebay for around £5 all in, and below is a handy guide for not only changing your fob battery,but also dismantling it in general. A common problem on the cars and 90% of the time its just the connectors under the seat. There is a yellow connector and a blue connector, often when the seat is moved or jerked they will pull out slightly. Just reinsert them / squeeze them in tighter and it will sort the airbag light. Make sure to do both sides just incase. Turn the car on and let the engine run for a second and then turn off, the light will then go off and be recorded by the cars ecu as fixed so you have full airbag safety again. The other 10% of the time theres an Airbag control module or side impact sensor which can fail, and whilst not expensive it then a T4 session will give you the exact error code to confirm which is at fault. This thread gives you loads of details on the under of the seats, how to remove them and airbag wiring and modules. This is very common on second hand cars, as the cable to the bonnet as a "dividing block" on it which stretches and sometimes pulls through. Should your cable snap you are going to have fun getting under your bonnet. There are many ways you could do it, but if you PM a member of the moderation team and explain the problem they will give you the list how. Its actually shockingly obvious and most mechanics would do the same. This bonnet cable and catch issue can be prevented by following the very basic advise in this thread! The usual common problem with our cars and one the forum has only managed to solve recently. Due to the design on the cars, you could actually replace everything and still have a poor handbrake because of a single simple metal clip which stetches and deforms over time. You will notice a little X to the right of the image pointing to a clip behind the tensioner. This is the section which warps and deforms over time. The thread below shows the part in detail. The dodgy handbrake - cure? Much debate as to the best solution to prevent this is ongoing, but most people are replacing the unit and having a perfect handbrake after. This again is around £10. 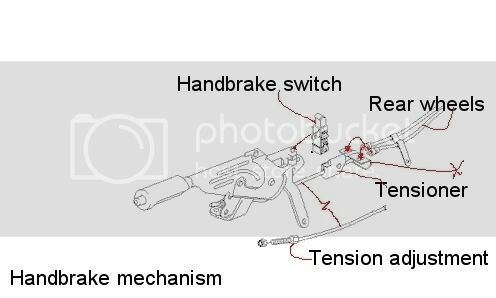 Below is the exact guide on how to set and adjust your handbrake correctly! The plenum is a chamber that collects fresh air to feed the interior vents/aircon system. It's located between the firewall at the rear of the engine and the wall which forms the front of the cab section. Air is supplied via the scuttle vents, which run across the body below the windscreen. It's important that the plenum remains dry because it houses the ECU. This is mounted a few inches above the floor on the firewall face. Also vulnerable to flood water is the pollen filter, which is mounted over a large hatch on the nearside of the rear wall. If the lower edge of the filter gets wet, it soon starts to smell and this gets into the cab with the incoming air. On Mark 1 models, there are two further rubber tubes which drain the upper plenum area. These are located on the upper front wings, near the bonnet hinges. On Mark 2 models (and some late Mark 1s), the driver's side drain is plugged off. This is because the drain is actually too high for water to enter and is therefore redundant. The upper drain tubes are similar to the others and have a flattened nozzle, which directs water onto the back of the wheel arch liner. From here, it runs onto the ground. Keeping an eye on this is very worthwhile, I myself was very lucky with my first ZT when the plenium under the ECU was filled with soil and had began to flood! This guide below gives some handy hints on the best way of servicing and preventing any further issues. The sunroof drains can occasionally do the same thing, and a guide here shows what to look for. Reversing light failure is nearly always due to a £5 switch which can be done in no time at all DIY. This guide explains everything in several simple photos and is not worth repeating in words. The first time this happens you will know it, the boot lock when opened sounds like a machine gun as the boot lock mechanism doesnt lift high enough off the lock. Again, prehaps after air bag light the most common fault on the cars. A few simple twists of the black rubbers either side of the boot to raise the boot light alignment height will resolve this always unless the motor is faulty. Rear light seals will usually be the fault of a boot leak and having nothing to door with the boot itself. Simply remove them from the car, and use some clear sealant around the seals to prevent this happening again. Also the rear "atmosphere" vents in the boot can leak, this guide explains how to fix them in great detail. Also in the tourer, check the seal around the rear window hasnt become dislodged or torn, this is a major cause of rear leaks in tourers along with rear light cluster clips that are broken off. Tyres often wear unevenly, especially at the rear. Some cars were supplied with misaligned suspension when new. It’s always a good idea to check rear tyre wear on early models, the best solution being to get a four-wheel alignment done. Front coil springs are also prone to breaking but the rears can also go. When having a full wheel allignment done it has been discovered that the car needs to have a FULL tank of petrol else i will continue to drift slightly to the left! Nice handy one this to test the dash is working fully, follow the simple guide and use the cluster test to ensure your dash and systems are functioning correctly! Two videos are below showing the Cluster System test in action. This is a useful and streamlined guide for viewing a car, prehaps as a first viewing should you be interested or if you know little about buying cars. Again, thanks to "rrobson" for taking the time to produce this for everyone benefit! Road tax disc,and if not sorn documentation. Coolant staining, any pink / red / orange staining in the engine bay is coolant, may have leaked. Check for mayo on dipstick or under oil filler cap - head gasket failure! When the car is properly warm, or when you get back, turn the car off and restart it, camshaft sensor sometimes stops working when the engine is hot so wont start. Last edited by Colin_NI; 3rd September 2011 at 21:13..
At the start in 1998 the cars where produced at the Rover group plant in Cowley, Oxfordshire, UK and remained there until production switched to Longbridge, Birmingham, UK in early 2000. The easiest way for you to spot if your car was produced in Cowley is along the bottom of the car which will be painted black the whole way round the car. These early Cowley cars have a tendency to rust slightly more as production methods where improved before assembly was changed to Longbridge. However this does not make them any less of a car but it is very worth paying extra attention to the cars especially as many of them will be at least ten years old now. The 75 and ZT where produced in both Saloon form and Tourer form. Saloon cars where produced from 1998 until 2005, Tourer versions where produced from 2001. The MG ZT and MG ZT-T where both launched in early 2001 as part of the MG Rover rebranding, but many reports conclude the cars where secretly developed whilst BMW actually owned the company! During the Spring of 2004, the entire MG Rover range received a facelift. This included the 75 and ZT's. Consisting of new headlights and revised front and rear bumpers, these cars are typically referred to as the ''Mark 2'' cars. It should be noted that on the Rover 75 V8 received a unique grill, and was an optional extra often refered to as ''The Premium Grill'' as seen below. It is very important to note that it is impossible to source the chrome surround on the premium bumper. Complete bumpers go for huge money on ebay and car breakers. (The club is working towards finding alternatives, including the Roewe 750 front grill which is not a direct swop). This was a factory option on all mk2 none V8 Rover 75's. The limo version featured the grill as standard. All "MK2" cars suffered from what looks like front bumper sag, but infact this is how how the car was designed to look with a visable gap between the bonnet and the bumper/lights. Some owners have modified the front brackets to aim the bumper up slightly. There are many threads on this so use the search function at the top of the forum. A long wheelbase Rover 75 Limousine also called Rover 75 Vanden Plas, about 200mm longer than the regular 75 and depending on customisiation the interior could be varied for whatever specification they choose. The photo below shows the difference in wheel base length. Often these vehicles where used as Government cars, even the former Prime Minster Tony Blair used one and its not that uncommon to find they have been particially reinforced for bullet and explosion prevention! Always usedful in the modern day school run! Below is the "mk2" revision of the limo, aka the Valden Plas which received the "Premium Grill" despite not being a V8. This photo shows the typical stretched rear interior of the limo cars. All Limo's are front wheel drive only, a single V8 rear wheel drive limo was made, but only as a prototype. The company's design team wanted to mark the first 100 years of the Rover marque with a stylish design that would sit confidently as the latest in the line of renowned Rovers like the P4, the handsome P5 coupe, the innovative P6 2000 model and the bold SD1 hatchback. Never sold and never to be sold, from the windscreen back it was all custom work made using the old style metal work by hand. This was realized in the form of the Rover 75 Coupe concept - a beautiful and elegant two-door expression of the stylish 75 Saloon. The concept's interior strongly focuses on Yew wood and Tan leather hide introducing the style of designer furniture into the automotive lounge, extending Rover's trademark for a welcoming interior. Peter Stevens, Rover's design director says: "I want people to turn away for a moment from post modern brutalism and to enjoy the elegant and timeless lines of the Rover 75 Coupe Concept design. The true character of a Rover comes from its ability to present a cosseting environment with comfort and refinement being the high priorities, elements that should be expressed in the form and detailing of the exterior of the car. "Heritage is a great strength for a marque as it gives you the terms of reference and something to build on for the future. That is exactly how we saw the challenge of presenting a Rover concept in its Centenary year." The car went through an identity change being "MG" badged up with the upcoming sale of MG Rover to the various chinese companies at the time, they wished to show how flexible the design team could be so several photos show the car with MG badges and a MG ZT small boo spoiler. An important issue to raise is the boot space in the saloon and tourers. Early saloon cars where reported NOT to have folding rear seats, and several owners have confirmed there are no obvious switches to fold the seats down however this is not common as 99% of the saloon cars have folding seats, this is something to check if you are buying an older car. Its worth digging around for these "pull tugs" here around the seat area in general which may allow you to fold the seatdown. The below photo shows a typical boot of the saloon, which is actually quite practical as you can fit two baby prams in it side by side and still have plenty of room for shopping etc. A short coming in the saloons is the actually boot height is quite shallow which doesnt effect you on a daily basis, but something you should be aware of if you wish to carry a lot of suitcases. Infact with an optional H and K sound system, the rear boot height space in the saloon is reduced again. Of these critisms, the 75/ZT actually has a MASSIVE boot for the car of its class, its hugely impressive. I myself personally have taken three Ikea full size bookshelves along with the weeks shop from Asda in the boot in a single go. And now for the tourer's boot space. Well to some it up rather quickly, look at the photo below, that includes the rear seats folded down. You can fit a small house inside it. If you need more space than the 75-T or ZT-T offers you will be VERY hard pushed to find a vehicle this side of a new 2010 shape Skoda Octavia Estate, never mind in the same price range. [LEFT]One rather nice feature of the Tourers is the ability to open the rear window without opening the boot itself. Handy should you wish to really fill the boot up with shopping and very popular with dog lovers! An optional Rover / MG Rover dog guard is available and is of extremely high quality. Make sure when viewing a tourer to bring a bottle of still water with you and pour it around the window to ensure the rubber seals etc are correct as they can be difficult to correct if the car has been damaged. You may even find the current owner doesnt know the window opens!!! Rover and later MG Rover offered a range of colour schemes on the car that at the time was hardly of equal for cars in the exective price range. Some colours where more subtle than the above yellow ZT however! A truely beautiful range of colours!!! A complete list has been complied by "Reebs" one of the forum moderators, and you can find the complete list of every known example along with photographs in this thread. Please click below to explore the thread! Its definatly worth reading through as there are some colours that stand head and shoulders above the rest and suit the cars even more! Rover and MG Rover offered single range of spoiler and bodykit options for the 75 and ZT's. These where often optional extras and are not common on the majority of cars. I have included a photo of my own car here, the kit which I fitted seperate (note the MG7 tail lights where purchased through a trader "Radioguy" on this very forum, yet again another club member benefit!). Note it has the large spoiler which was standard on all ZT+ models until the cars where changed to mk2's. The single bodykit options for the cars where a set of side skirts/sill covers and rear "spats" which wraped around the rear bumper, you can clearly see them along the bottom areas of the car. The skirts fitted all varients including all mk1 or mk2 and saloon/tourer (but not limo cars) but the rear spats where available in two types. One type was for use on the 75/ZT mk1 saloon (as seen on my car above), the other type could be used on mk2 cars and also mk1 tourers owning to them not reaching around the rear bumper as seen below. Also on this silver car is the smaller spoiler fitted to the mk2 ZT's as standard. Some late mk1's also had this fitted. Several owners have fitted them to other saloons across the range and some have even fitted both as seen below, creating a Sierra Cosworth Whale Tail effect! No spoilers are available for the tourer owing to the rear window opening up, however some members have created subtle modified lip spoilers around the edge of the metal work. One thing about the bodykits is that there are fibreglass replicas out there which are of varying quality so take that into consideration should you wish to buy one. Last edited by Colin_NI; 30th July 2017 at 06:40..
Below is a detailed list of information of the engine you are interested in and relating to it including average costs, service bills and what to look out for. Please scroll down to view the engines. Stats for MPG, engine power and such are listed at the bottom based on a combination of multiple car sites providing such information from manufacture supplied sources and second hand car websites. Long wheel base / Limo variants have their engine specifics listed at the very bottom of the list. Tourers typicially have zero significent real world effect on statistics etc. All Rover 75 and MG ZT's are simple to work on, with only a few jobs requiring specialist kit, but normal servicing and such can easily be done DIY to save you money. It is recemmended 100% that you purchase on of these Haynes books. Halfords sell them for about £18 however they go on ebay for about £9 a book. A well worthwhile and essential referance!!! When purchasing (or prehaps after) it can be worthwhile checking you engine stamp number, below is a complete guide (bar the V8 models) on how to simply decode it. Worth checking along with your VIN number. The K-Series engine is a series of engines built by Powertrain Ltd, a sister company of MG Rover. The engine was built in two forms: a straight-four cylinder, available with SOHC (single cam) and DOHC (twin cam), ranging from a 1.1 L to 1.8 L.
The K-Series was introduced in 1988 by Rover Group as a powerplant for the Rover 200 car. It was revolutionary in that it was the first volume production implementation of the low pressure sand casting technique. This works by injecting liquid aluminium into an upturned sand mould from below. In this way any oxide film always remains on the surface of the casting and is not stirred into the casting structure. This production technology overcame many of the inherent problems of casting aluminium components and consequently permitted lower casting wall thickness and higher strength to weight ratios. However, the process required the use of heat treated LM25 material which gave the engines a reputation for being fragile. An engine overheat would often result in the material becoming annealed and rendering the components scrap. The aluminium engine blocks were fitted with spun cast iron cylinder liners that were initially manufactured by GKN's Sheepbridge Stokes of Chesterfield, but replaced by spun cast iron liners made by Goetze after some seminal research conducted by Charles Bernstein at Longbridge, which proved influential even to Ducati for their race engines. Unfortunately a large number of aftermarket and replacement engines, (the so called "VHPD"s" very high performance derivative as used in the 187 bhp lotus elise) were built with the old substandard GKNs by Minister, Lotus and PTP well after the Goetze liner's introduction to the production line in 2000. The engine was introduced initially in 1.1 L single overhead cam and 1.4 L dual overhead cam versions. The engines were held together as a sandwich of components by long through-bolts which held the engine under compression, though this construction is not unknown in early lightweight fighter engines from the First World War. It had also been used in motorcycle engines and Triumph Car's "Sabrina" race engine. As the Honda engines became obsolescent and were phased out, but well before the BMW takeover, an enlargement of the K Series design to 1.6 and 1.8 litres was carried out. This was done by using larger diameter cylinder liners and also increasing the stroke. The change required a block redesign with the removal of the cylinder block's top deck and a change from "wet" liners to "damp" liners. The plastic throttle body fitted to the engine until 2001 was manufactured by the SU Carburettor company - they also included aluminium and larger sized bodies. The two types of head that were bolted to the common four-cylinder block were designated K8 (8 valves) and K16 (16 valves). A later head design also incorporated a Rover-designed Variable Valve Control (VVC) unit (derived from an expired AP patent). This allowed more power to be developed without compromising low-speed torque and flexibility. The Rover 75 was never fitted with the VVC engine, instead receiving the turbo application instead. When purchasing a 1.8/1.8T ask if the head gasket was done. If it was done, ask for the receipts as often people cheat and simply pour a tank of "Radweld or K seal" into the engine coolant tank which will temporarily cure the car, often enough for you to have driven the car away and it fail a week or two later. Its a dirty trick in the second hand market, HOWEVER some people have reported it has worked to their advantage curing tiny leaks. The K-Series engine has gained a reputation for head gasket trouble. This is due to a range of problems including build tolerances, reduced block face stiffness, casting quality and material and cooling system layout. A number of changes were made over the years to improve the condition. Amongst the first of the changes was the introduction of steel head locating dowels. Early versions of the K Series engine had steel dowels, but these were loose fitting and used as an assembly aid. Plastic dowels were then introduced to prevent head face damage on the assembly line and also as a cost saving. This engine had wet liners and a solid block top deck and was not known for being prone to gasket failure. The plastic dowels were carried forward to the redesigned K series which was then available in 1600 and 1800 capacities by using damp liners and an open block design. However, it became apparent that this engine had an issue with head gasket failure which was partly due to lack of stiffness in the head/block interface. To help reduce this shuffling, steel dowels were reintroduced, but with a tight fit to fix the head securely to the block face. This reduced one mode of head gasket failure caused by movement between the block and head faces, but was only partly successful because the dowels only helped in their local areas. The gasket itself was also subject to minor improvements to the sealing bead design over the years. During its later years, the cooling system of some models was also modified by the introduction of a PRT (pressure release thermostat). This allowed increased coolant flow at high engine loads even before high temperatures were reached and reduced the thermal shock the engine saw when a conventional thermostat was first opened. This thermal shock would cause differential expansion across the gasket face causing relative movement between head and block. A new design of head gasket has been available for several years from Land Rover which can be retro-fitted to all K-Series engines. This is of the MLS (multi layer steel) design. This has now been superseded by a new MLS design that is used in conjunction with higher tensile head bolts and strengthened oil rail (into which the bolts are screwed). A modified tightening method is also used with the new bolts. The effectiveness is yet to be proved. Destined to be introduced with the Euro IV emissions compliant engine in late 2005 was the MLS gasket and strengthened oil rail. The aim of the latter is to improve engine rigidity. But this was never introduced by MG Rover Group as the company had gone bankrupt by the time of the planned launch. The N-Series engine (basically the aforementioned Euro IV-compliant K-Series) in the MG TF relaunched by Nanjing Automotive in September 2008, has these modifications as standard. Common to ALL petrol cars. The fuel must be delivered at the correct pressure or it won't start. You can hear the petrol pumping up (priming) when you start the car with the key in the ignition. Often the intank fuel pump will "separate" as its of a screw in design, simply the pressure will push it to unscrew. This can be prevented by fitting an orange clip. The cars many ECUs checks delivery pressure. If the delivery of fuel to the engine and a untouched filter module without the orange clip isn't diagnosing FFS (nor indeed the lack of it) then a simple fuel pressure bleed caused by a fractionally slackened filter cap will ensure it doesn't start. This can usually be the most obvious sign from a cold engine of head gasket failure, especially when the engine is cold, BUT it can also mean something much simpler but also as concerning as in this case the white smoke wont be oily. Coolant or water vapour leaking from the inlet manifold. After the car reaches running temperature the smoke typically reduces to almost a small amount. Unburnt fuel can be a cause of white smoke also. Fuelling problem will make smoke billow out and make it judder, and it becomes obvious car is only running on 3 cylinders at times. The key difference between the Inlet Manifold Gasket failure and the Head Gasket failure (HGF), is the engine will run normally. Number 4 cylinder is a usual suspect for the gasket to leak coolant into. If it was HGF I would expect the cooling system to be pressurizing and the car would not be running right at all. Don't use any inlet manifold gaskets that aren't genuine ones, always found them to go brittle with heat. The simplist thing is to replace the inlet gasket and have the coolant system bled and engine serviced. Not too many issues effecting the 1.8 Turbo specifically. Obviously with the engine having a turbo fitted you can have issues, and they start around 2500 to 3000rpm, the hesitation is only around 2600 to 2800 under hard acceleration, sort of like a splutter in power then whoosh, your off! The problem is typicially the black vacume hose where it joins the turbo,, the rubber joining piece at the end can become oversized due to the heat of the turbo and surrounding area. It has a spring clip around it to maintain the seal, this doesnt work allowing a loss of vacuum and wastegate problems leading to ignition cutting out (ECU safemode) hence the hesitation. A new set of solenoid vacuum hoses, three of which to replace around £35 and you will be back to normal. If your 1.8 Turbo is running a little "lumpy" or "rough", with revs at idle searching in and around 750 to 900 plus up to 4500 rpm its great but then lacks instead of pulling to 6700rpm then your looking at a M.A.F failure (providing you have checked the hoses above into the turbo). The arm between the vacuum actuator and the waste gate can seize where it pivots on the waste gate lever. This will cause an over boost, and usually will temporarily cut the ignition to protect the engine giving you a stall or a safe mode activation (where the car runs very slowly). Again, a simple clean of the pivot and applied a high temp anti seize spray available from your local motorfactors will resolve this providing your actuator hasnt failed outright but the car would display an engine fault light if it does. Additionally old spark plugs, failing spark leads an incorrect spark plug gapping can create the same or similar feeling. So if all of that hasnt scared you off then heres the good news now, assuming you have covered all the regular issues listed then actual maintenance of the 1.8 engines is actually quite inexpensive providing you service it when you should. In fact its the cheapest car of the lot to service. Depending on usage, a 12,000 mile service is perfectly acceptable, some do around 6000 miles if the car is used less frequently, but its up to yourself. Rover specificed 15,000 miles originally or once per year. Use of the correct coolant is recommended so use O.A.T coolant, which is pink in colour. Save yourself over Halfords prices and buy none-diluted from your local Vauxhaul dealership. 5 litres will cost you about £22 maximum and when you mix it 50:50 gives you 10 litres of coolant. Use a 10W/40 or 15W/40 oil meeting both ACEA A3 and ACEA B3:96 specifications, and having a viscosity band recommended for the temperature range of your locality. Last edited by Colin_NI; 3rd September 2011 at 21:35..
Use a 10W/40 oil meeting specification ACEA A2:96 and having a viscosity band recommended for the temperature range of your locality. Alternatively, a 10W/40 engine oil meeting specification ACEA A1:96 can be used, and this specification may improve fuel economy. Last edited by Colin_NI; 30th July 2017 at 06:41..